Keen garden photographer Judy Lawrance shares some of her favourite locally-grown flowers. As an enthusiastic plant and garden photographer, I attend many local and national flower shows during the spring, summer and autumn months. The Malvern Spring and Autumn Festivals and the BBC Gardeners’ World Live at the NEC are always a thrill for me as I can travel there and back, click away with my camera to my heart’s content and come away with the most amazing variety of images – all in one day! Despite the popularity and “wow” of the show gardens at the larger events, the floral marquees, in my opinion, offer the most variety and interest. As you walk through the doorway of these canvas structures, you are met with a kaleidoscope of colour and a heady fragrance emanating from the huge bowls of perfumed flowers, usually lilies, placed near the entrance (perhaps to lure people in). When you look around the marquee, every flower head is perfect, every leaf in its place and every colour coordinated. Proud British growers man their stands and are only too willing to share their stories of how it all started for them. Once inside, my first port of call is the Flowers From The Farm exhibit. These incredible stands are planned, constructed and manned by volunteer local flower growers. Their imaginative, complex displays and the variety of British-grown flowers they use is impressive, to say the least. Not only that, they are such a friendly bunch (excuse the pun) and are very happy to share information with anyone who takes an interest. Flowers From The Farm, founded in 2011 by arable farmer Gill Hodson, is a network of independent like-minded artisan British flower growers spread over the UK. The 500-strong membership is a mixture of farmers, gardeners, smallholders and florists. Some have small cutting gardens to feed their floristry businesses, some have acres of land growing a variety of flowers to supply shops, but no matter how big or small their plot, these dedicated and passionate creatives all have a common goal – to produce British, sell British and promote British-grown flowers, the ones that are perfumed, quirky, imperfect and beautiful! You don’t have to look far for a FFTF florist; there are several dotted around the West Midlands and Worcestershire (visit their website to find one near you). Many of them run workshops, besides supplying funeral, corporate and more especially wedding flowers. What could be better than a wedding bouquet to touch a bride’s senses as she walks down the aisle, and table decorations that perfume the air. The delicious smell of English roses, peonies, lilies and jasmine and the like, all playing their part in the memories of that special day. 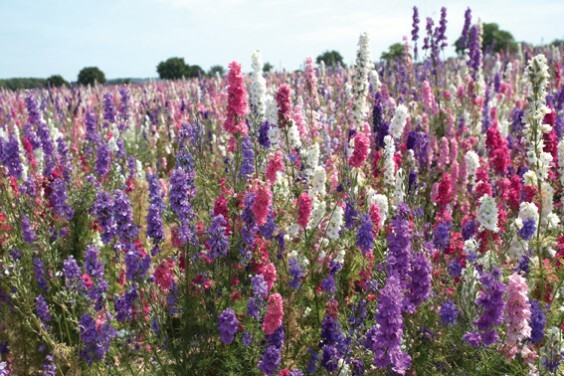 On a similar note, and continuing the wedding theme, the Real Flower Petal Confetti Company at Wick in Pershore grow delphiniums – acres of them (above). They are open to visitors just before harvest-time, but for only 10 days a year, so if you blink you’ll miss it. It’s a sight to behold, as far as the eye can see: hues of pinks, blending into mauves, purples, whites and reds, and all of them grown for the purpose of making biodegradable confetti. Here today, gone tomorrow. The day after the last visitor leaves, the crop is harvested, by hand, the colour being maintained by laying the petals out to dry in the sun. They are then packaged and offered for sale on their website. Another British grower who has dedicated his life to growing British flowers is David Austin of David Austin Roses based in Wolverhampton. A visit to the gardens and tearooms is not to be missed. Although many of his varieties repeat-flower, the best times to visit are June and September, when most varieties are in full bloom. As you enter the gardens, the scent is in the air, subtle but penetrating, and you can’t help but stoop down and take a bloom in the hand for a closer smell! There are more than 400 varieties on sale, with names such as Judi Dench, Emily Bronte, Maid Marion and Scarborough Fair, evoking that sense of English-ness. The gardens contain very little else other than rose bushes, climbers and ramblers. You’d think it would be too much, an overkill, but it’s not; it’s a place to linger and sit and contemplate. As you enter the Long Garden, the central walkway, you realise that this is no ordinary place. This area, interlaced with rose-clad pergolas, contains a collection of old roses that flower just once a year. Leading off from there, the formal, circular Victorian walled garden is divided into “pinwheel” sections, each section outlined with manicured box hedging and filled with English roses and repeat-flowering shrub roses. These roses flower right through to the frosts of early winter. The Renaissance Garden is as you’d imagine: Italian-looking with English rose bushes lining a long straight pool that runs down the centre, flanked by wide borders leading to a verandah with seating, a welcome respite on a hot summer’s day. Then of course, there’s English lavender, sold all over the world and grown on our very own doorstep. In mid-July in Snowshill, Broadway, there’s an unmistakable perfume in the air, when the fields at Cotswold Lavender are in full bloom. For a small entry fee you can walk among the rows of plants, offering a great photo opportunity for families with small children. Even in our British climate, there is hardly a month during the year when growers in the UK can’t produce something of interest. So it’s heartbreaking to think that although £2bn a year is spent on cut flowers, only 12 per cent of the flowers sold in the UK are grown here. Flowers grown for the European market are imported from the likes of Kenya and Colombia. On the 127 farms in Kenya, flowers are grown in polytunnels and picked by poorly-paid workers. They are watered three times a day and when cut, dipped in antibacterial solution before being chilled to put them in a state of semi-hibernation. Under these controlled conditions, each flower is the same as the next, the same size head, the same length, the same shade, with very little or no perfume. They are then flown overnight 4,000 miles to Holland, where they are sorted, graded and packaged before being auctioned and forwarded on to their final European destinations. However, it’s unrealistic to think that we can grow enough flowers in the UK to meet demand, at a price we’re prepared to pay. With that in mind, the imported flowers in our supermarkets will always have the market share. They are cheap and cheerful and easy to add to the weekly shop. But for those special occasions, I believe we could all do more to support our British growers. Their blooms have no air miles so are therefore environmentally friendly, they have character and soul, they have provenance, and best of all, they have perfume. And if we have to pay a little more for these fresh, long-lasting, scented flowers, then I believe they are worth every penny.